Whelped on August 8, 2005, Calypso Scooby began his racing career in June 2007. He had promising skills and was advancing well until October 8, 2007. 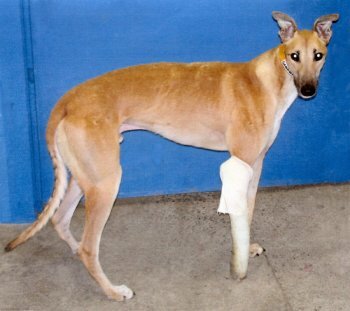 Early in his race Scooby sustained a severe fracture of his leg (see x-ray insert). Being in the lead pack when his leg fractured, he was blessed on that day not to have sustained greater injury. As he slowed and went to the outside lane, the remaining dogs somehow avoided colliding with him. The second miracle was having extra track staff available who were immediate in their response and aided Scooby in receiving veterinary care that included splinting of his leg. A short time later Scott Bruns arrived in the MGPS hauler for a planned pick-up of retiring dogs. After hearing Scooby’s story he asked to bring him back to MGPS but was denied. With further explanation of the veterinary care capabilities and available supportive care at MGPS, Scott was then granted his wish. After arriving back in Augusta, MGPS veterinarian, Dr. Alan Slack DVM, reviewed x-rays of Scooby’s leg and felt that although the leg fracture was severe, amputation would not be necessary. Instead a full-length leg cast and pain management was prescribed. 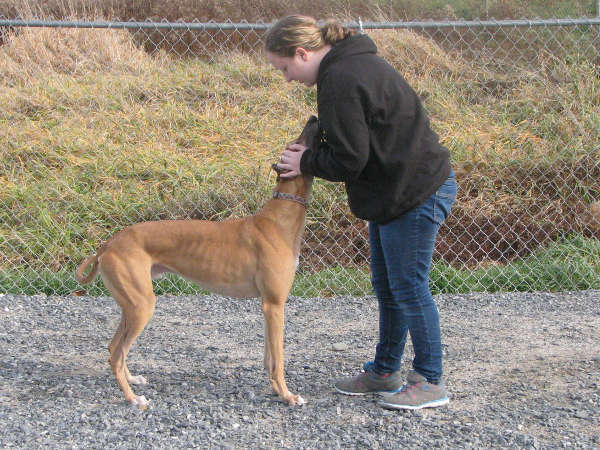 At the kennel Scooby received a great deal of attention with strict orders for non-weight bearing activity, needing assistance to the pen by using his hind legs, and cast care as well as extra tender-loving-care. Three weeks later x-rays were taken to check the bone healing process, which was progressing well. As the cast was being replaced an area of skin breakdown around a bony prominence was found and treated. After two weeks another set of x-rays were taken. At that time the fracture was healing so well, Dr. Slack elected to have Scooby neutered, which turned out to be a more difficult procedure than usual. While healing, Scooby exhibited the indomitable spirit for which he has become known and fully recovered. His last cast was removed shortly there after and physical therapy was begun on his shoulder and leg muscles that had atrophied from lack of use. He continued to gain strength daily and received special loving care from staff and volunteers at MGPS. To the delight of everyone involved in Scooby’s care, he was adopted on Dec. 22 and placed in his forever home where he is doing very well. 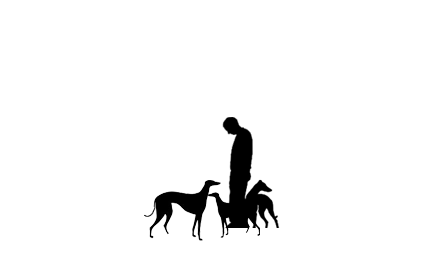 The Glendower Fund is named in memory of one of our special Greyhounds, who was a great ambassador promoting Greyhound adoption. Donations to the fund enable MGPS to provide care to retired racing dogs like Scooby that require additional veterinary care for them to be healthy and ready for adoption. Greyhounds with fractured legs, infections, lacerations or significant dental problems have received supportive care through generous donations to this fund.